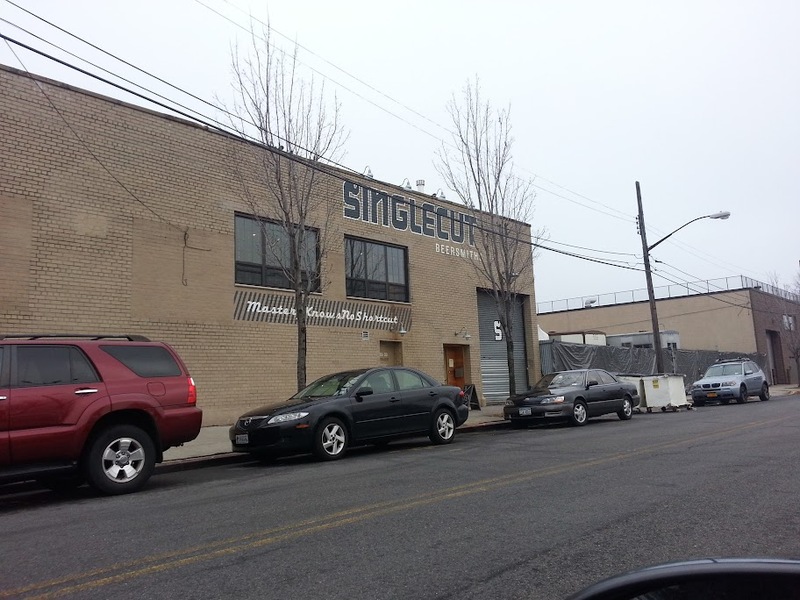 I had the chance to get out to Astoria to visit Singlecut Beersmiths this weekend and check out the beer. I was not disappointed. I don’t have to tell you how craft beer has taken off over the last decade or so, and like so many other tidal waves of change, it washes up a lot of muck along with the gems. We’ve all tasted those craft beers that are merely “Not Bud” or simply ordinary, so when a new brewery opens up it’s not uncommon to meet it with a little skepticism and wait to see if they’re going to do more than create pale imitations of the popular craft beers already in the market. I’m happy to report that this is not the case with Singlecut. 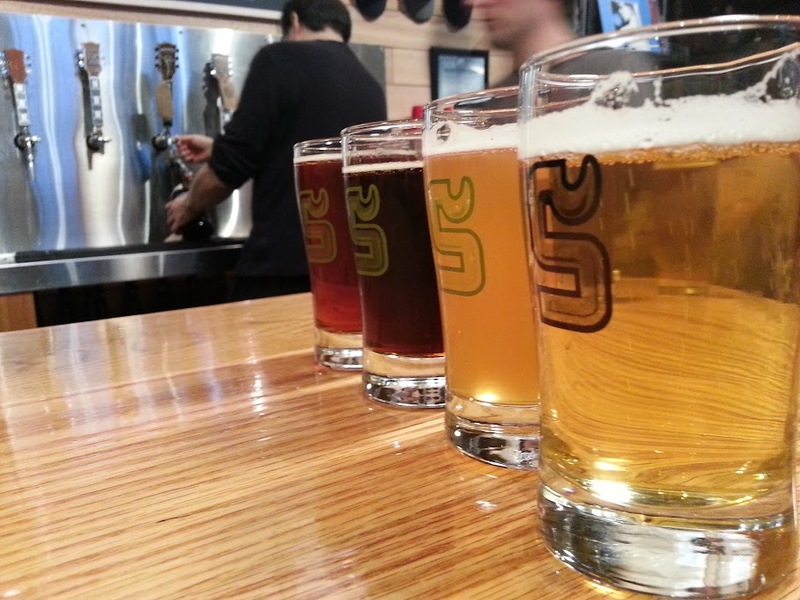 The beersmiths put care and effort into crafting these delicious beers, and it shows. They had four on tap when I got there, and they’ve got two IPAs coming very soon. Forward to back is the 19-33 Lagrrr!, the Jån Olympic White Lagrrr!, the John Michael Dark Lyric Lagrrr!, and the Dean Pacific Northwest Mahogany Ale. The 19-33 was a crisp Czech-style pilsner, enjoyable although basic. The Jån is described as a uniquely hued and flavored Lagrrr! and you can see it’s opaque like a hefeweizen. Their blog says it’s brewed with Matzoh Meal. It was delicious, and the one my three companions enjoyed the most. It’s still a lager and enjoys all the qualities of a lager, but with a richness and flavor akin to a wheat beer. Next up is the Dark Lyric, which was my favorite. I’ve been on a black lager and black IPA kick for a while though, so perhaps that swayed my vote. Dark Lyric did not disappoint, providing a moderately hoppy beer with a gentle roastiness to it. Lastly, for now, was the Dean Pacific NW Mahogany Ale. This one was extremely hoppy, perhaps too much for the style, but I like hops and don’t care about defined styles so I’m not complaining. The bitterness masks some of the other flavor you’d expect so it trended more towards an amber than a brown, but the Pacific Northwest is known for hops so it’s not unexpected. We visited at four on a Saturday and the place was pretty crowded. It was a neat little place that seems to be drawing a lot of interest. They had barrels stacked in the fermentation, and I’m told they were a Bock being aged in rum barrels, so I’m excited to try that in the future. 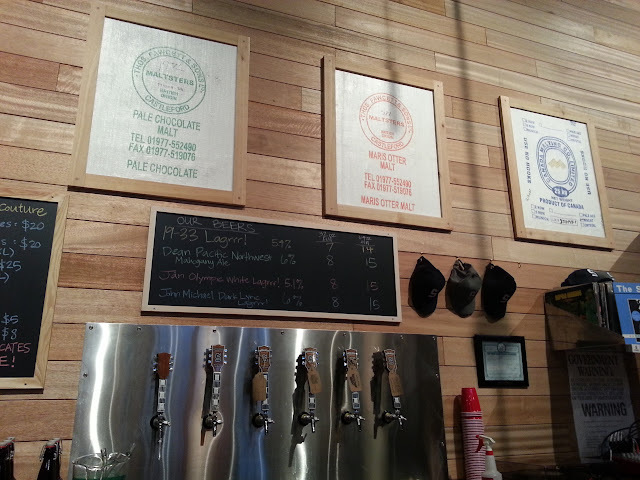 They framed some of the bags of malt they used in the beer and hung them on the walls, which was a neat idea. The record player and records for music was a nice touch as well, and fitting with the music theme. I appreciate the quirky descriptions of their beers (check the list on the website) but could’ve used some more basic tasting notes, beyond just IBU and ABV, both on the website and at the tasting room. I overheard some talk about a homebrew club on weekends and noticed one of the guys behind the bar with a Brewstoria shirt (who is also the foursquare mayor), and although I’m not going to go over the bridge for such a thing, it’s a good idea.